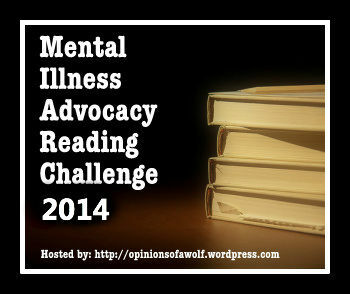 I am pleased to announce that I will again by hosting the Mental Illness Advocacy (MIA) Reading Challenge for 2014! I started the MIA Reading Challenge in December 2010 in an effort to raise awareness, knowledge, and acceptance of mental illness. Reading, both fiction and nonfiction, is an excellent way to broaden one’s horizons and expose one to new ideas and ways of thinking and being. Many reading challenges already exist in the book blogging community to address racism, sexism, and homophobia, but I could not find any to address the stigma faced by those suffering from mental illness. In spite of mental illnesses being recognized by the scientific community as diseases just like physical ones, many still think those suffering from one are at fault for their own suffering. I hope reading and reviewing books featuring characters struggling to deal with mental illness, whether their own or another person’s, will help remove the stigma faced on a daily basis by those with a mental illness. They already have to struggle with an illness; they shouldn’t have to face a stigma too. If you’re having trouble coming up with books to read for the challenge, check out the list of recommended reads that I maintain on the challenge’s main page. Sign up by filling out the sign up form! I will post a list of all 2014’s participants on the challenge’s main page. Feel free to grab the badge on this announcement to feature on your blogs. You can also join the GoodReads Group if you want. Please make an announcement post on your blog about your participation to help spread the word. Leave links to your reviews throughout 2014 by commenting with them on the challenge’s main page. Thanks, and I hope you’ll consider participating! Sadly I don’t think I will be able to take part next year with my college course going on but I am so glad to see this challenge is still going! No worries, Jessica! Taking a class tends to eat up a lot of time when you also work. I’m glad you were able to participate in previous years! Signing up again this next year, my post will be going up on Tuesday. I still need to finish one more book for this year.